The lovely Laura from Yummy Mummy Flabby Tummy has tagged me to join in with this Christmas meme. So here goes, let’s get into the Christmas Spirit! Q1. What’s your favourite thing about Christmas? My favourite thing has to be the smiles! The smiles from everyone because of the atmosphere, the hugs, the food, the gifts, the spending time together – I love the smiles! Q2. What’s your favourite make-up look for the festive season? I don’t tend to wear make up, too much effort in day to day life! But for Christmas it has to be a spot of lip gloss and a red and white hat! Fake! I like the idea of a real one, but with two young kiddies we have thought a fake one is more practical! Q4. Giving or receiving presents? Giving! I love giving! Every year I am told that my Christmas List is pathetic. But the truth is my head is so full of ideas for others, that I can only think of things I need rather than things I want, and people don’t want to buy me a frying pan or new cutlery for Christmas! I love the giving of Christmas, the thinking of what someone would like, the buying, the wrapping and the smiles! Q5. Do you open your presents on Christmas morning or evening? Both! We get up and if Santa has been we have a look through stockings! Then heading down stairs, the kids will open one or two before a special breakfast and getting dressed! Then we have a few here and there and are often opening gifts in the evening too! Bought. Love the idea of making them, but I am just far to lazy! Q7. What’s your favourite Christmas film? OOO far too many! Muppets Christmas Carol and the Grinch are definite. I love Elf. Scrooged, er The Santa Claus, oh I can’t decide! Hubby says it is Star Wars. Q8. What’s your favourite Christmas food? Does Mulled wine class as food? I am a veggie, so Turkey doesn’t take part! I do love Sprouts (I know I am in the minority!). Christmas Pud and Stollen are always present too! 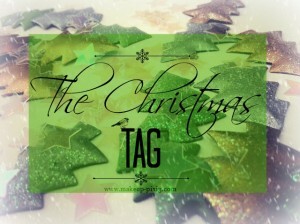 And now I tag some these bloggers to share their Christmas with me! I think it’s probably likely my fella would list Star Wars as a festive family favourite too!